Claude Monet, Adolphe Monet in the Garden of Le Coteau at Sainte-Adresse, oil on canvas, 32 1/2 x 39 5/8 in., 1867. Anonymous loan. MANCHESTER, NH.- One of Claude Monets most celebrated early paintingsAdolphe Monet in the Garden of Le Coteau at Sainte-Adresseis now on view in the Curriers European Gallery for a limited time. The painting, which has been on public view only once in a museum, remained in the artists family until 2004. It will return to its owner in early July, and no future public showings are scheduled. Adolphe Monet in the Garden of Le Coteau at Sainte-Adresse is an early painting (1867) of Monet's father, and was in the artist family for several generations. It has never been shown in North America. In 1867 Monet was only 27 years old. Adolph Monet in the Garden of Le Coteau at Sainte-Adresse was painted two years before the Curriers own early Monet The Seine at Bougival, and a full seven years before the term Impressionism was coined in 1874 by a French art critic. The two paintings are displayed together for the first time. Impressionism reached its full maturity in the 1880s, and was the dominant style for another decade in much of Europe. 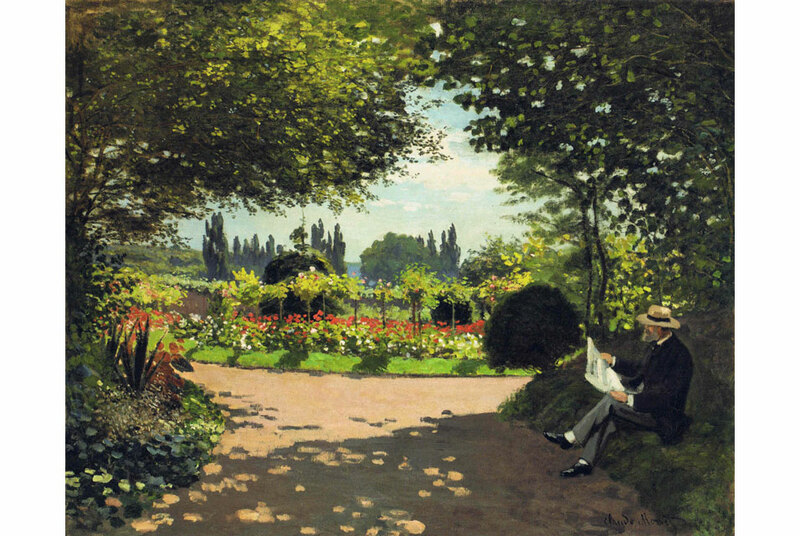 Adolphe Monet in the Garden of Le Coteau at Sainte-Adresse depicts the artists father reading a newspaper under a canopy of shade trees. The center of the composition provides a vista into a sunlit, flowering garden on the estate Le Coteau in Sainte-Addresse, a town along the Normandy coast. It was on display once, two years ago in Paris at the Galeries nationales du Grand Palais in a major retrospective exhibition of Monets work. The seeds of Impressionism are clearly evident in both paintings. In the painting of Monets father, Adolphe, the palette is bold, the brushstrokes are expressive, and the focus is on broad areas of light and shadow rather than the objects themselves. In the Curriers Seine at Bougival, the artist expresses the fleeting quality of sunlight passing through dappled clouds, and the brushstrokes have become more pronounced and the application of paint thicker and more dynamic.